Hello friends – hope you all well. I was away for a month on vacation to India. Here am back again and look forward to all your support and motivation. Today I tried a new combination and this one will most definitely be made again very soon! I’m kind of impressed by this kheer, it’s so simple yet incredibly flavorful and comforting at the same time. I think it would be perfect to serve as a simple dessert. Carrots include reduced cholesterol, prevention from heart attacks, warding off of certain cancers, improving vision, and reducing the signs of premature aging. Furthermore, carrots have the ability to increase the health of your skin, boost the immune system, improve digestion, increase cardiovascular health, detoxify the body, and boost oral health in a variety of ways. They also provide a well-rounded influx of vitamins and minerals. Boil carrots, squash/pumpkin in enough water till they are completely cooked. If there is excess water drain and retain for further use and allow it to cool a bit. Now add carrot, pumpkin/squash puree, dissolved milk powder, Stevia/fruit sugar mixture and stir well until combined. Add vanilla essence mix well and cook for another minutes or two. 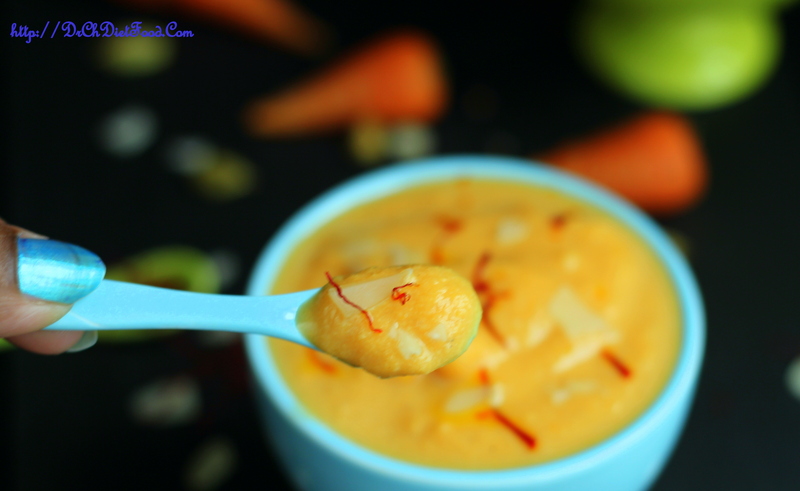 Garnish with nuts, saffron and serve hot or refrigerate for 3-4 hours and serve chilled. Fruit sugar/stevia can be replaced with brown sugar/white sugar or any sweetener of choice. Sweetness can be personalised as per the taste. Vanilla essence can be replaced with any flavours of choice. 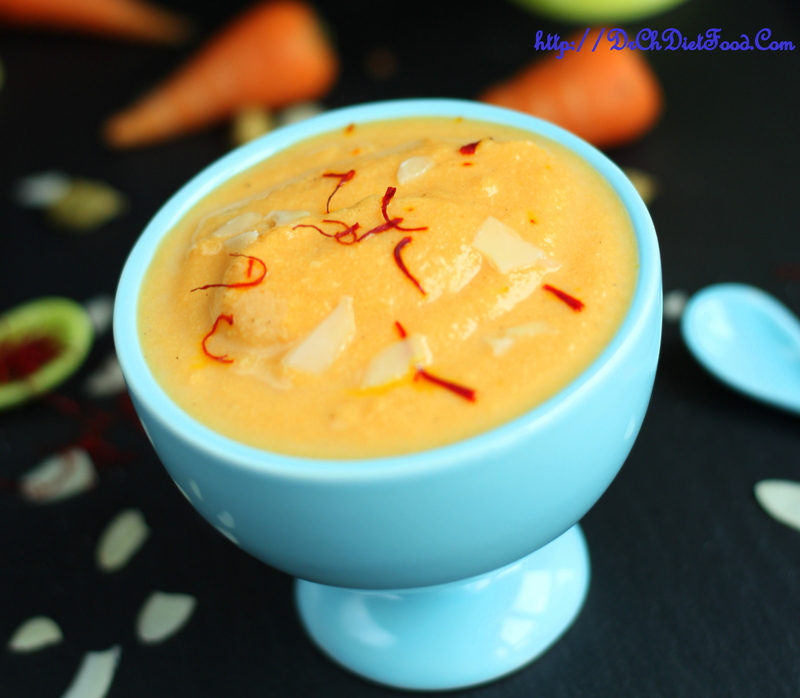 Posted on September 13, 2015, in Indian and tagged carrot kheer, Carrot squash porridge, diabetic sweets recipes, festival healthy sweets, healthy kheer, healthy payasam, kheer phpto styling.., pumpkin/ squash kheer, sugar free sweets. Bookmark the permalink. 96 Comments. Hi Angel. .. glad to hear from you…np at all I understand how tough with manage with you work and shifting… hope you are all settled in your new place… Howz it going on? It’s going great thank you! We just need to get a bit more furniture and then we’re done. I hope you and your family will be dropping by to see us – we’re not too far from you! How was your trip? That is wonderful Dr. Chitra I am so delighted. I will thread your blog directly on the list. Visit http://wegrazetogether.wordpress.com. The response just over its inception 3 days ago has been wonderful and I will no doubt in the near future .com the web site. It will list your Blog and the general public worldwide can click to your website and it will take them directly there. Very simple, easy concept. With your approval I will add your blog. Best Regards, Cheryl. My pleasure and am honoured …. Thank you Cheryl. ..
Hello there, hope you enjoyed the summer. Yes sir… just trying to settle down… hope ypu doing good sir? Welcome back Chitra -hope India was fun! Thank you Laura… yes had a pleasurefull trip..
Chitra this looks delicious!! 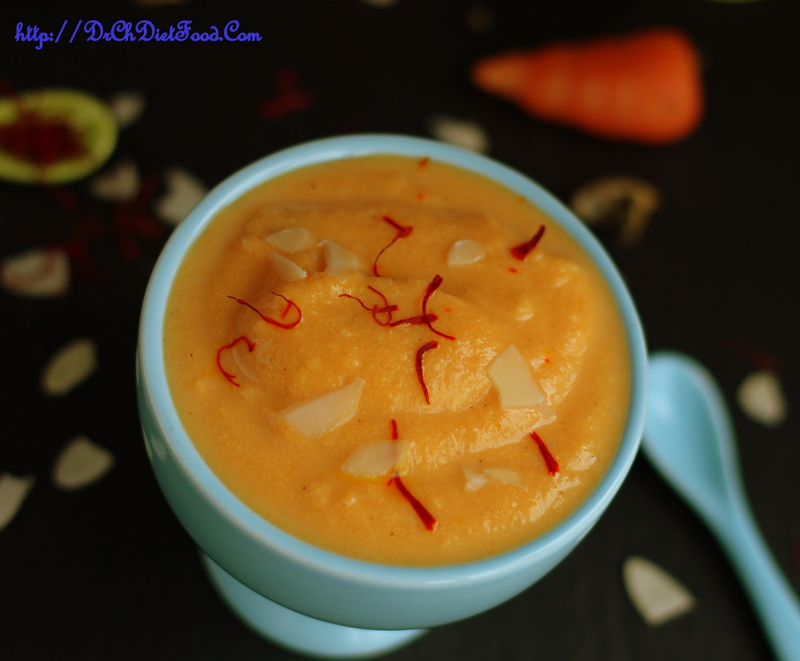 I love seeing those saffron threads and really love anything creamy!! Thanx a lot Vw ..
Good looking and good for you too. Double win! Hugs! Thanx a lot Vasantha ji… thatz really sweet of you and thanx for stopping by…hope you doing good..? Thank you Emma… oh sure, am honoured to do so but is it ok eith you if i do it it sometime end of this month or you just let me know when you want me to so I can just try to make it by then…Thank you.. Welcome back. Hope you had a great time. Thank you Aunt Juju… oh i loved them, they caught my sight while shopping and coudnt resist them from buying and glad you liked them too…. I missed you. I figured WordPress or Facebook lost your posts. 🙂 I hope your trip was restful and fun. Hi Jackie..hope you are doing good…I missed you all too and your sweet and encouraging words are always boasts me and am truely blessed…thanx for all the support and encouragement. 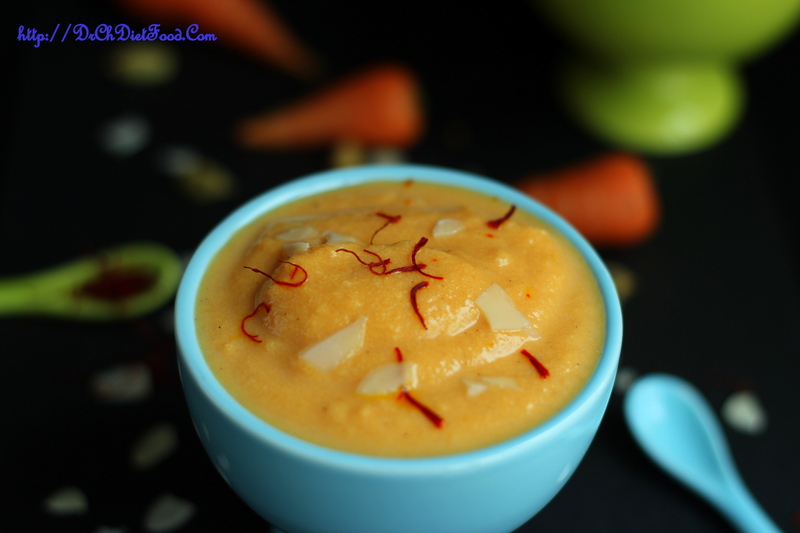 ..
Never tried a pumpkin carrot flavoured rice pudding… this looks amazing ! Thanx a lot Erica. …..
What nuts do you prefer to use? Would pistachios work? this is beautiful and sounds delicious! very nice! good day to you as well! Welcome back Chitra!! I hope you had a wonderful, relaxing, rejuvenating vacation. This recipe sounds like a great Fall dish. It was a short break and felt good to meet family…Hope you well. This sounds so good and healthy–perfect for fall! I’ve been looking for pumpkin recipes outside of my traditional meals I make and this looks gorgeous, great flavors! Chitra this looks great and sounds yummy!! Thank you and happy tp hear such compliments. Never tried this combo before..Sounds interesting.. Thank you Lisha. … please do try and am sure you would it..
Love the combo dear. Looks so delicious and YUMMY!